A single-family house as a place for a family to live has had a long and mixed evolution. From stone caves through cabins and sheds made of wood and skins, clay and stone structures to contemporary brick, cellular concrete and assembled houses, the development of single-family homes has been dependent on strides made in construction technology, craftsmanship and availability of construction materials. Human settlements have always reflected both the different status of people in society and the cultural level and demands people had in that period. The quality of single-family houses has been increasing in direct proportion to the development of industrially-made construction parts. The basic requirements for single-family houses, such as protection against climatic influences, safeguarding property, guaranteeing privacy and raising children, have continued to this day. Single-family homes can generally be divided, according to their owners’ standard of living, into urban and rural houses. In cities and towns, a type of burgher’s house has developed, where houses had been connected to the operation of a workshop or a business, while rural homes were mainly tailored to breeding domesticated animals and agricultural work. V rôznych častiach sveta sa vyvinuli rôzne typy rodinných domov, ktoré zodpovedajú dobe a miestu vzniku a výške životnej úrovne v danej dobe. V našich stredoeurópskych podmienkach je tradícia budovania rodinných domov z pevných materiálov – kameň, tehla s veľmi dlhou životnosťou. Rodinné sídlo sa budovalo pre niekoľko generácií. 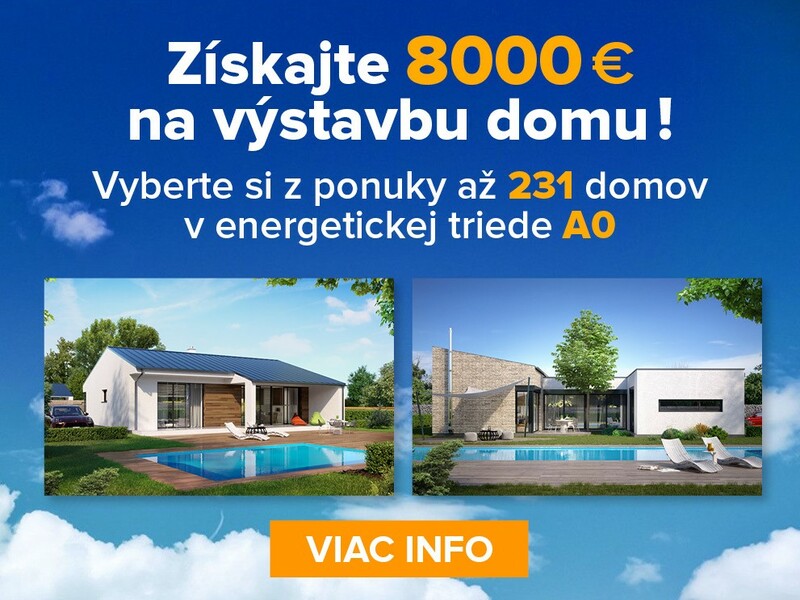 V niektorých oblastiach Francúzska a Talianska sú dodnes obývané kamenné domy, ktoré majú viac ako 500 rokov. Rodinný dom sa buduje ako investícia do budúcnosti, jej hodnota v čase rastie.In different parts of the world, various types of single-family homes have developed, corresponding to the time and place of their origin and the living standard in that particular period of time. Conditions experienced in Central Europe brought about a tradition of building single-family homes with a long life from firm, solid materials such as stones and bricks. A family estate would be built to last several generations. In some parts of France and Italy, stone houses over 500 years old are still lived in to this day. A single-family house is built as an investment for the future and whose value increases over time. In recent years, there have been new trends in easy-to-assemble houses arriving to us in Europe, in particular from America. This turnkey house style has been very difficult for us to pursue, as opposed to the American way of living, where a single-family house is understood to be a consumer good like a car or refrigerator and not an investment in the future. Such a house is much cheaper there (unlike in Europe) and several moves are made in the course of a lifetime due to frequent migration to a new job or on account of the family’s changing size. The fact that Europeans are more conservative was also confirmed by the National Statistical Office of Austria, where assembled turnkey houses only amounted to 33% of all the single-family homes built in 2002. Austria has one of the highest percentages of assembled homes in Europe, with more than 50 domestic and some tens of foreign firms offering assembled houses. The Swiss are even more conservative and assembled single-family turnkey houses constitute only a tiny fraction of all newly-built homes. It is similar in Slovakia and the Czech Republic and even though there are several firms building assembled homes, they only thrive with great difficulty. Unfortunately, this custom can be compared to an iron shirt where building contractors would rather construct homes in the sense of “my house my castle”. Look quickly at the advantages and disadvantages of both systems. Useful life – companies usually advertise that their houses can last 50-100 years, but ask an experienced real estate agent how well 30-year OKAL houses are selling. Contracted construction – assembled houses are impossible to build by a home builder alone and therefore the ability to save some money is lost. Soundproofing – some systems using easily-assembled materials for walls have worse soundproofing properties. Heat accumulation – using light materials means weak accumulation ability (constant heating is necessary). Useful life – with the present quality of construction materials and products, today’s modern buildings can last several hundred years. Investment – “today” you build for “100” and “tomorrow” it will be worth “200” – probably the most striking advantage. It is no longer rare for houses built 20 years ago for 300,000-400,000 SKK to sell today for 5–10 million SKK. Soundproofing – with heavy materials and thick walls, soundproofing is significantly better and has a direct impact on the living comfort of a several-member family. Heat accumulation – excellent accumulation ability, with the advantage of reduced heating during the night with no noticeable drop in temperature. Thermal resistance – these days the disadvantage is simply eliminated by popular thermal insulation. A contemporary single-family home may be characterized as a modern suburban-type house which, in consideration of contemporary lifestyle and way of life, is penetrating the countryside. Near large cities and adjacent villages with good transportation connections, satellite suburban developments of new houses are sprouting in communities where people do not work but commute to jobs in the cities. This migration into newly-built houses in the countryside is a trend across all Europe and results from several factors. Probably the most significant is the demand for a healthy environment to raise children. Another undoubtedly significant factor is the quiet way of life in the country, where a person flustered and stressed out with city life is looking for some time to relax. Likewise, the price for construction plots, the number available and infrastructural readiness is more favorable then in cities. Finally, technical development of information technologies and communication networks as well as computer technology allow more and more people to work at home and not have to commute daily to work. A new lifestyle also changes the current functions in a family house. Relaxation takes precedence while economically productive functions are pushed into the background. The basic requirement in contemporary single-family homes is, in particular, an optimal dispositional layout. Large-volume living space on the house’s ground floor, connected to outdoor areas such as terraces, gardens, pools and popular fireplaces, increase the overall quality of family life. Upstairs there are usually spaces for each family member’s individual needs. Interest in high quality technical and esthetic interior design as well as technical furnishings inside the house are increasing in prominence. The issue of warm water, decreasing operational costs and saving energy and water are coming to the forefront. In direct proportion to the increase in the standard of living and financial security comes the need for increasing storage space. A big favorite is built-in cabinets which already need to be considered in any design. Last, but not least, an increasing demand for a healthy environment is forcing people to exclusively use inspected construction products and materials that do not represent a health risk. Trends in single-family home construction over the near future are not too difficult to forecast. First, there will be a continually more intensive demand for energy savings, through low-energy houses, which consume about 50% of the energy of regular homes – our Company’s EKOLINE line, including “passive” houses, are able to cope with just the energy the house produces itself. New forms of space heating – both floor and wall heating, new types of condensation boilers, sun collectors to heat water and, not infrequently, also homes as well as various types of heat pumps are being used more often. By decreasing the demand for energy, the environment will also be preserved. Together with requirements for permanently increasing quality in construction materials and products, demands for maintenance and servicing will expand, along with a decrease in related costs. The development of information technology for engineering and furnishing households will have a very substantial influence. Systems already exist at present which dictate how electrical appliances, lighting, heating, water and home security operate within the entire house. The “intelligent home” will know our requirements and be able to meet them. By connecting such a system to the internet, you can not just review all attributes but also direct them from any location on earth. Such an intelligent system can do anything you can think of. For example: the last person to leave the house can let you know by his or her voice that a skylight window in the upper floor children’s room had been left open and was just closed. While vacationing in Mallorca, you can look through a webcam at whether the lawn has dried up and, if not, you can have the system lengthen the watering cycle to any duration or your mobile can send you a message that your home has just been forcibly opened and the system has already called the local police, etc. Developments in information technology, the internet and different videoconferencing options are now letting a greater number of people work from their homes, resulting also in a change of the single-family house’s function into a place to work, with related demands for space and technological equipment. Maybe the second most difficult question, before deciding what you will be building when you construct your single-family house and just behind the selection of a construction plot, will be selecting the design for the house. For this reason, we recommend you pay pertinent attention to this question. Many newly-minted owners of a new single-family house are saying, shortly after moving in, that they should have built something else. It can be said that everyone’s a general after the battle. So it happened. To make a good choice of a single-family home, it is useful to know a few important points. The external architecture of a single-family house is subject to different stylish trends, just like fashion and music. If you want to avoid such trends, we recommend moderation, employing nothing that is either nonfunctional or useless. It is quite difficult to give advice on something that is nice. Beauty is relative. Someone can be pleased with it while another person is not. With the external architecture, you can decide on whatever home fits in the most with the surroundings it will be standing in. Be aware that the exterior of your single-family home produces an environment for all of us and it will have a distinct beauty-creating function. A farmhouse in an exclusive and elegant urban neighborhood with wide roofs will look as awkward as a super modern steel and glass building among country houses. Least important is tailoring the dimensions and slope of the land. In essence, a large house stands on a large plot and a small house stands on a small plot. It makes no sense at any price to plant a catalogued design on a sharp slope. We recommend here that you fully utilize the features of the property and give an individual design sufficient space. Unless the outside architecture is entirely just your choice, have the interior and blueprint design fully and exclusively conform to your needs and the needs of your family members. Consider in detail all the activities you and your entire family will be doing and write them down on a piece of paper, go through them one after another, comparing them with the house’s layout, and think about whether you can find space in the house to do them. Here we recommend maximum moderation and an effort toward multifunctional utilization of rooms, e.g. a guest room can be used when no guests are staying at the house as a study and a technical room, other than the furnace room, can have a washer and dryer. The most common mistake people make, which owners of single-family homes admit after they have lived in one for a few years, is “BIG EYES”. This means the size of the house as well as the land itself was uselessly too big. Few builders are aware when they choose a home that a common 9x12 meter two-storey, half basement house has the area of four respectable three-room apartments!!! And this space has to be also maintained, cleaned and, obviously, heated! Likewise, they are not aware that what had been then two teenagers will not be living with them forever and, at the expense of an empty room and dining room, they realize the enormous children’s rooms they had built will in a few years be empty. Another part of a single-family house where there can be considerable savings is the basement. More and more people have recently become aware of this and are expressing interest in having no basement or only a half basement. If you can manage to handily put the three most important functions a basement has (furnace room, laundry room and storage room) in the ground floor or upper floor of the house, the basement becomes rather unnecessary, not to speak about the challenge of insulating the basement for ground humidity and the problem of groundwater pressure and susceptibility to faults. An inexpensive and at the same time quite remarkable substitute for a basement storage room can be space above the collets in the roof truss, which can be reached from the upper floor corridor with tilted stairs or a ladder. For owners of large plots of land, we recommend a wooden garden house, which can be a very esthetic addition to an ornamental garden. Another area where considerable resources can be saved is the garage. One cubic meter of a garage built into the house costs you almost as much as a cubic of living space. It is not rare for the garage to be significantly more expensive than the car itself. A suitable substitute for a garage can be a wooden shelter with a flat roof or a saddle roof. The price of a single-family house is in direct proportion to its size. It is certainly more rational to build a smaller home from high-quality, long-lasting materials with good technical equipment than to uselessly overdo volume and get into a situation where, for financial reasons in order to complete the house, you are forced to choose the cheapest materials and products, whose quality and, chiefly, durability is in question. Here the saying is 100% true: “We are not so wealthy to allow ourselves to buy cheap things.” Reconstruction after ten years may cost more than the building itself does now.